For more than 30 years, Ice Studio has been proud to carve the most stunning and creative ice sculptures on the famous Las Vegas Strip. Under the direction of our founder, Master Ice Sculptor Juan Carlos, we have elevated ice to an art form. Our proprietary freezing technique produces unparalleled clarity and hardness, resulting in long lasting and spectacular sculptures. Our experienced and expert staff is ready to manufacture for any event. Contact us today at 702.873.6933 to transform your event into a celebration. The only limit is your imagination. 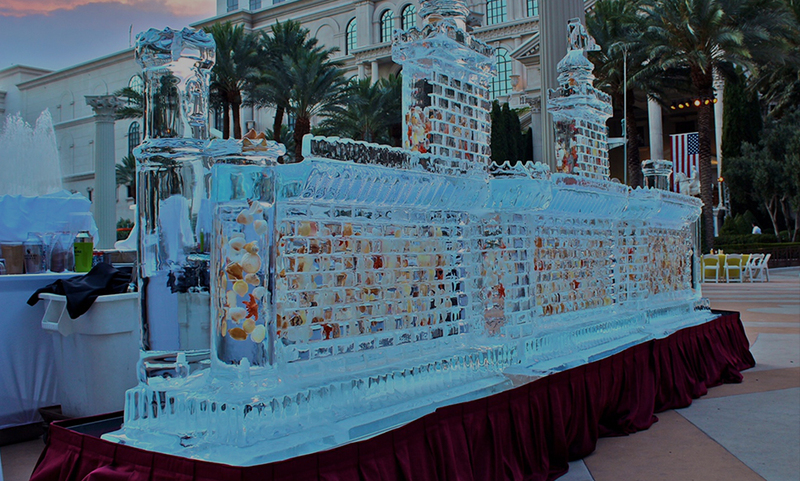 Our expert carvers can transform any concept into a stunning ice sculpture. The perfect centerpiece for weddings, anniversaries, graduations, banquets, and other special events. Take “on the rocks” to a whole new level by serving drinks from a bar completely carved out of ice. It’s sure to be the coolest spot at your party. The best drinking game on the planet, pour alcohol through the frozen ice of the luge and and straight into the drinker’s mouth. You can also use a cup, but it’s not as much fun. Great for champagne or shots. Serving food at your event? Keep it cool with dishes made from ice. We can create ice bowls, dishes, glasses, and more. Perfect for chilled seafood or frozen desserts. Promoting your company, team, or product? 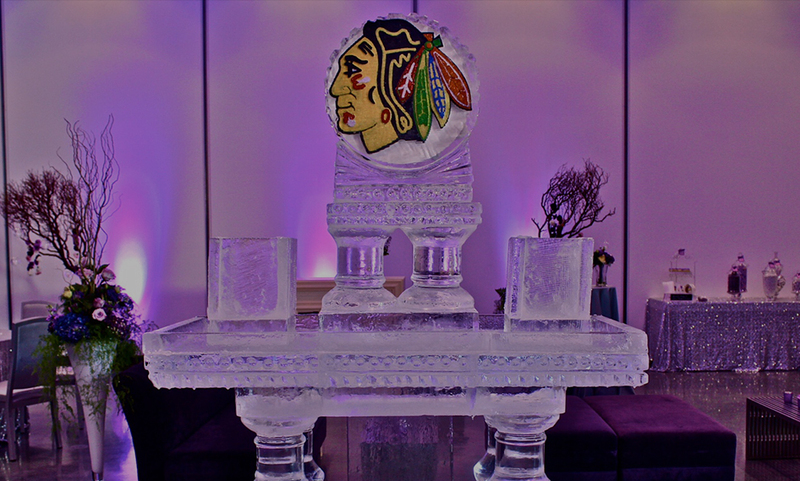 We will digitally carve your logo in color onto an ice sculpture. The ideal centerpiece for your corporate event. Need superior bar ice to compliment your premium spirits? We manufacture crystal clear ice blocks in multiple sizes for any need. Serve your customers the very best ice. There is no centerpiece more beautiful for a wedding reception or other special event than the pure elegance of a crystal clear ice sculpture. Planning a corporate meeting, launching a new product, or honoring your top performers? 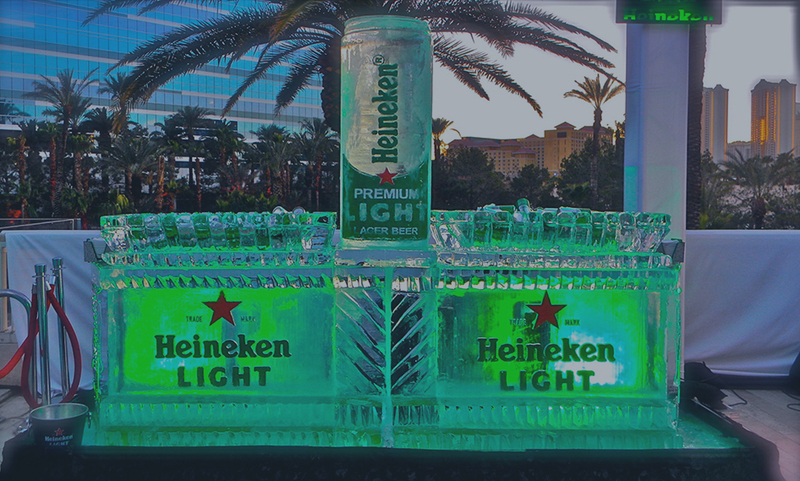 Expand your brand with the company logo carved in ice. Looking to add something truly unique to your next party? Our food displays, ice bars, and ice luges transform food and drink into spectacular interactive displays. Whether you are celebrating the most important day of your life or rewarding your team for a job well done, nothing makes an occasion special like ice.